Trying to figure out is Home Profit System a scam or legit? Is this just another desperate attempt to rid you of your time, expose you identity and financial resources. Let us begin the process of elimination by stripping back the Home Profit System website – one thread at a time! Well usually, this would be the typical course of action taken whilst conducting an investigation into a company pending review. Though unfortunately, Home Profit System is not quite as robust as it seems. Don’t get your hopes up thinking that Home Profit System is an actual educative platform, or resourceful source of information designed to make you profit from the comfort of your own home. It’s far less valuable than that and this is hardly ever the case. 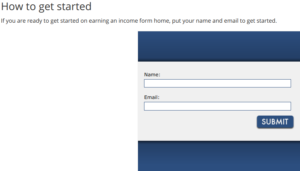 We are sad to inform you that Home Profit System is nothing more, nothing less than a simple email capture – static page! By opening the website URL you will be confronted with an enticing, yet short conversion pitch that is well written and pretty self-explanatory. If you snag the hook and enter your name and email credentials. Steven Chang will have the power to market, advertise and sell products and services to you and/or his potentially sizeable list of subscribers. If you had high expectations for the Home Profit System today, sorry to ruin your day! As you might have guessed already. There is not much info to go on from here. But if you’re keen to try out Home Profit System. First you need to complete the email capture form – squeeze page. You can access the domain name in the review section above! *Verdict: Confusing, waste of time! Home Profit System is not exactly a product or service. It’s not even a well branded business or company for that matter. It’s simply just a squeeze page used for the collection of electronic mailing (email) addresses. Pity! One thing we gathered from signing up to this email carrier. There was a physical address attached to the confirmation email sent to us. We included this in the review section. By entering and searching up that physical address in Google – There are apparently two businesses populated at this very address. 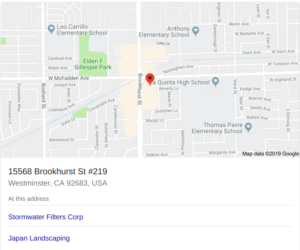 Storm Water Fillers Corp – Water treatment plant in Westminster, California. Japan Landscaping. General contractor business at the same location. Another thing we can take away from this unusual predicament. Storm Water Fillers Corp Is apparently owned by a so called Dave Belasco. The Japan Landscaping owners name is Rick Hirata. “Steven” might be using a phoney physical address on his Aweber – email responder. Considering that Home Profit System has been in operation since 1998, Steven Chang might have moved from this residency and cares little for updating his new address in his auto responder. It’s also quite possible that this could be a fake physical address used to give Home Profit System a degree of legitimacy. This raises a few concerns for us and makes it difficult to trust Steven Chang and his Home Profit System scheme. There is little evidence to suggest that Home Profit System is something that works, let alone exists outside of the email squeeze page. What we do know is that Home Profit System is a web page created by Elegant Themes. Shortly after entering our email (alias) into the required fields in the attempt to login to the Home Profit System website. We received nothing more than a confirmation email sent to our virtual letter box. We yet to receive clarification, or invitation for any opportunities since registering to the Home Profit System’s email capture page. We will keep you posted with any updates if anything significant or scammy is sent to our inbox! 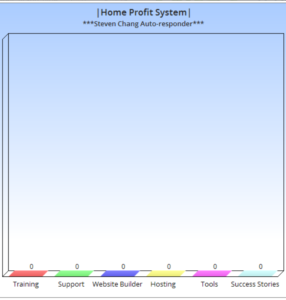 It’s truly hard to identify if that Home Profit System is a scam or not by analysing the Home Profit System domain page. Just because this is a tacky method used to collect both cold and warm leads, doesn’t rule out the fact that it’s a scam or legit. Right now Home Profit System appears to lay dormant. Meaning that this software is just collecting emails each and every day until a sizeable list is collected. Or whenever it best suits owner Steven Chang to continue advertising material to his leads. It’s probable that Steven Chang will promote products and/or services to try to earn affiliate commissions. Unless of course, Mr. Chang has plans of creating his own product base or service behind the scenes. There aren’t any exact complaint accounts filed on the Better Business Bureau (BBB) or Federal Trade Commission (FTC). This is not to our surprise though because Home Profit System is only a basic email collection site. What is there to say that we could associate a positive experience with Home Profit System. Perhaps YOU could shed some light on this matter below! Thankfully, no up-sells, or forceful sales pitches were sent immediately after subscribing to Home Profit System – Guru Consulting Services. This doesn’t mean it won’t happen further down the track. There’s no real indication whether Steven Chang is a real person. No educative material or training is offered upon subscribing to Steven’s list. There is no conclusive evidence to suggest that Home Profit System is even an opportunity following the sign up web page. If your sold on the idea that Steven Chang can shape your mindset and teach his 4 quadrants of success tips. Leave your email address into his capture page. Maybe you might receive an email regarding this opportunity or maybe you won’t! We do not advise you to provide your details or get your hopes up for this idea. Mainly because there isn’t any concrete evidence suggesting that Steven Chang is a legitimate mentor, or Home Profit System is a legitimate resource of information. Honestly, Do Not Waste Your Precious Time Mucking Around With This Guy. We Have The Solution For You! Apply Your Time and Energy Into Learning How To Develop Your Very Own Internet-Based Business. It’s Not As Complex As It Sounds! ONE that will grow over time through your own personal sacrifice and efforts. ONE that you can be proud of and reap the fruits of your intellectual labour. ONE that has a plethora of fruitful information about the company. And of course, the co-founders who run the show. This way you can give yourself peace of mind and learn from those of which who genuinely care about your online success! We hope this short article has offered some invaluable advice today. Do you have any insider knowledge regarding Home Profit System that we could add to this post? Please leave us your insights in the comments. We urge you to stay safe online and Home Profit System bares the markings of a bogus scheme! 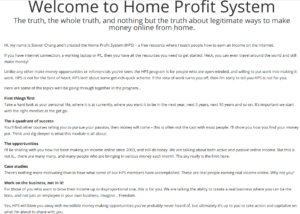 This is an excellent comprehensive review about home profit system. After reading your review, I understood this product’s originality and I think this is definitely a scam. I am staying out of this type of opportunity. I believe that this is not the best choice for us and I also compared it with the wealthy affiliate training. So I have found that this is a low-quality product without real opportunity. Thanks for writing this awesome review. Thanks for this review on home coming system and all it is about. I must commend you for taking your time to write this review on home coming system, it really show you have done your findings and research on it and I hope this serve as eye open to many. I don’t know their motives of collecting peoples mail address but never the less, time will tell what they want to do with it and we will later rule it out maybe is a scam or legit. Firstly i would like to appreciate this review about the Home Profit System as you have saved people like myself who have not registered on the platform not to do that as there is no way this platform helps you make any online income. I want to agree with you that it’s just a way of collecting emails and marketing products to them, nothing more nothing less. Thanks for the review. Home system really need to step up their game and face the reality in affiliate marketing. How can a platform that has been in existence since 1998 still use outdated marketing strategy. 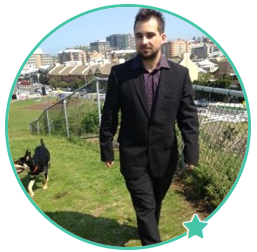 With zero website building functionality, zero support, zero training, zero success story, I don’t think I can comfortably recommend it to anybody! Home profit system to me looks too good to be true. There are many systems like this that are reaping people off their hard earned money. Many claimed what they can not offer. I would rather go for a proven program that is also vast in the ability to develop online affiliate marketers. Such program should not only provide a means of income, but also a personal development to the prospective marketer. 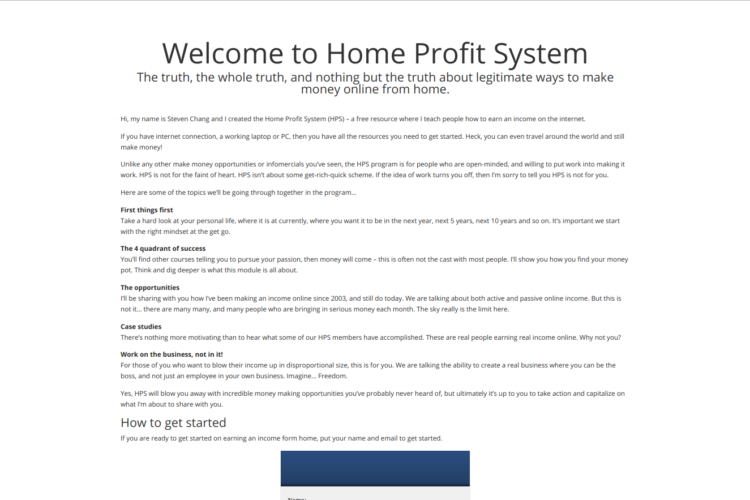 I have heard about home profit system before but I do not really know how it works but reading through this I now understand every bit of this platform. I must commend you for taking your time to share this review you must have done a lot of research to come up with this. This is an enlightenment to everyone concerning this platform, thanks for sharing this and I will keep following your site to get meaningful content like this . Thank you a bunch for the write-up. It’s always good to know which programs are worth checking out and it’s pretty hard to actually know that without either diving in or stumbling across a blog and reading a review. Yours was solid and so is your recommendation. I appreciate the info.